Who doesn’t want to have flawless, glowing skin? I love the radiance on the skin of certain people I meet. I can say that a radiant, glowing skin automatically raises the caliber of the person. 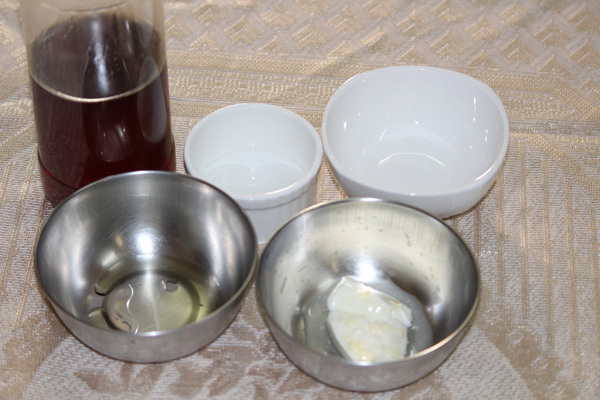 Now, I’m going to share a recipe for a DIY face mask that will help you have such a flawless glowing skin. I hate putting on commercial products that have un-pronounceable ingredients in them. Although I have not succeeded in eliminating all of the commercial products, I’m working on it. So this face mask is all natural (assuming you use the ingredients in natural, un-processed form) and you can do it yourself at home. The ingredients are not so hard to find! Most of them are already either in your kitchen or in your fridge. Just take a mixing bowl and add all the ingredients and mix well with a spoon. 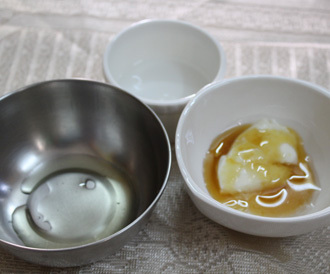 Make sure the yogurt is thick so that the mixture is of thick consistency and not runny. I do it this way. Just 15 minutes before the shower, I apply the face mask all over my face and my neck. I don’t leave the area under eyes and my eye lids (coz none of the ingredients are bad or irritating to the skin as far as I know, at least to me). I also apply the mask to my forearms and ankles. I wait for 10-15 mins. If you can keep it longer, the better. And then I step into the shower and wash the mask with warm water. While I start to wash it off, I make circular motions with my finger tips to give one last boost. Warm water opens up the pores and the circular massage helps the ingredients of the mask to penetrate into your pores – that’s the one last boost I’m talking about. And if you are using a moisturizing soap like me, its OK to use soap on your face to wash off the mask. If not, use a moisturizing face wash.
After you have washed off the mask, you can turn the water to normal heat and while you are about to step out, turn the water to run cold – as cold as you can stand! And then pat dry your face and apply a moisturizer (optional). Why does this mask work? I use this mask roughly 3 or 4 times a week and my skin glows. I get a “shiny” tint on my skin tone. And not to mention, I have made my skin visibly lighter in complexion (so people ask me) in about 1 month of consistent usage. Please note that I’m not a fan of skin lightening, but this was a surprise. So I am not going to leave you to wonder why this mask works or use it without knowing what the ingredients do to your skin (unlike the commercial products). Let’s break it down. When you eat yogurt you get a lot of stuff from it – calcium, enzymes, nutrients, probiotics etc. But when you put it on your skin the only good thing is the lactic acid in it. It will soothe rough skin and will make it soft. It will also remove dead skin cells gently. Due to its anti-bacterial properties, yogurt will fight acne (I know you’ll love this). I actually had 2 patches of acne marks on my both cheeks. And now they are visibly getting lighter. Even though they have not completely gone away (yet) I guess I can erase them in a month or so. If you treat yourself with this mask in the evening after work, you can do good for skin discoloration that occurs due to environmental pollution, sun and other factors. By the way, I apply this mask before my evening shower. Yogurt can also lighten your skin and a consistent usage of this mask (at least 3 times a week) for about a month will get you at least one shade lighter. Honey is an anti-oxidant and also has anti-inflammatory properties. 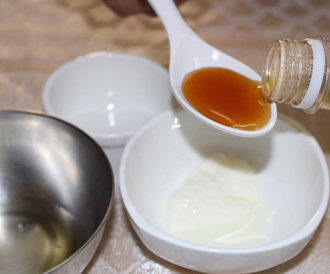 More importantly, honey acts as a good moisturizer and it also firms your skin. The anti-oxidant properties of honey assist in anti-aging treatment. 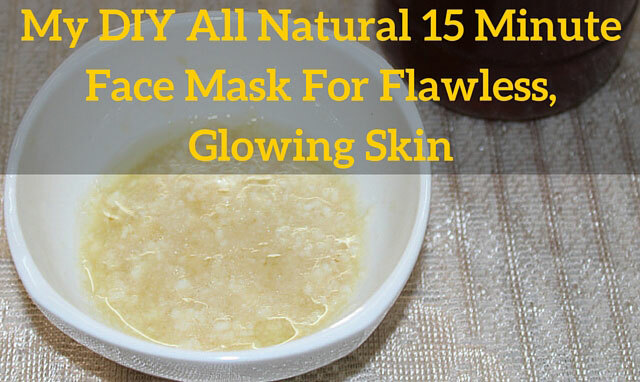 Hence consistent use of this mask will keep your wrinkles away at least for a while. 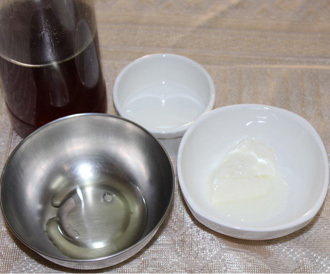 And if you already have wrinkles, you can minimize them a lot by using this mask consistently. The natural anti-oxidants in honey will not only keep your skin soft but also hydrates it and that’s how you get the radiant “glowing” look after using this mask. Oh and honey also acts as a cleansing agent by absorbing dirt and unwanted product deposits from your pores. I can talk about the benefits of olive oil all day. It has numerous benefits on your skin and on your hair. Olive oil has recently become my go to product in all my skin care and hair care routines. Olive oil is known long ago for erasing blemishes, pimple and acne marks on your skin. The oil will lighten your skin color when used regularly. People use olive oil to remove small pox marks. Olive oil has excellent anti-ageing properties and will remove fine wrinkles. And if you are worried that your skin is oily, don’t worry! 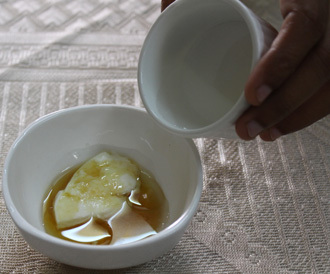 Olive oil is not greasy and it will not make your skin oily. However if you still feel so, you can do a double wash with a mild face wash or a mild moisturizing soap. Even if your skin is the most sensitive one, you can safely use olive oil on it since its so gentle. And it has great moisturizing properties (take note if you have dry skin). Initially when I started using olive oil, I got mild break outs once or twice and then my skin adjusted. Now I can enjoy olive oil on my skin without any problems. So if you see a breakout (especially if you are new to this oil) don’t give up. In this mask I use rose water mainly for its calming effect. It is only an optional ingredient; if you can’t find it, you can still use this mask. However if you add it to this mix it can keep your skin fresh and charming. It acts as a cleanser and removes dirt from your skin and gives you a “clear” skin. If your skin is irritated for some reason, the rose water in this mask will soothe your skin and will heal it too. For best results use natural rose water (put petals of rose in water and bring to boil; let it cool and then strain and refrigerate). But the commercial ones are OK too. Disclaimer: Always do your due diligence when trying out something on your skin. Not all types of skin react the same way even to natural products. If you already know that you are allergic to any of the ingredients in this mask (especially yogurt) feel free to drop it. And if you are doubtful, do a patch test to see how your skin reacts before using the mask all over your face. And, the results may vary depending upon your usage, skin tone, skin color, your diet, your environmental conditions and many other factors. 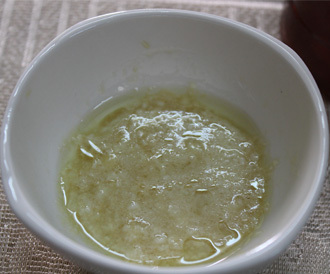 Did you like my all natural DIY recipe for flawless, glowing skin? Try this out (read my disclaimer above before you try, by the way) and let me know. I’d love to hear from you. Leaving a dairy product on your skin for a long time is generally not good. 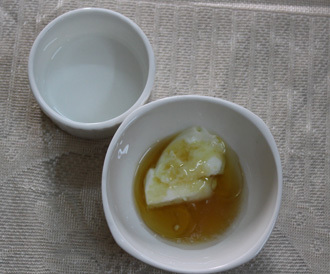 The honey is fine but the yogurt is not that good when left overnight. It feels uncomfortable in bed. Especially the tight effect created by honey makes it uncomfortable for you to smile or do any other facial movements. The sweetness of honey can invite unwanted attention from other beings (I certainly didn’t mean your husband here). So ya, try it out and let me know.